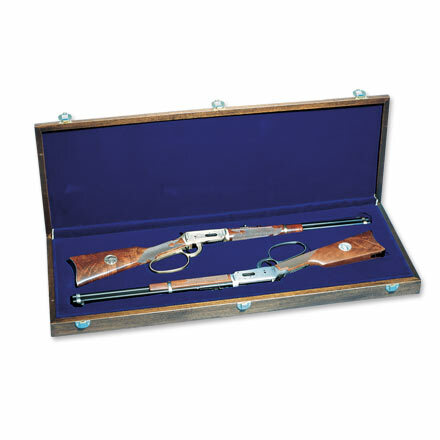 Twin Rifle Case | Custom wood boxes and cases. Made in the USA. Custom wood specialties. Made in the USA. Our Twin Rifle Storage Case showcases Pocumtuck's ability to manufacture a larger scale and more heavy duty case with the same craftsmanship and quality found in our smaller boxes. Designed for rifle maker Winchester, this case features a walnut exterior and a flocked flat foam interior. While a custom- fitted recessed foam interior is an option, here we used foam that compresses slightly upon closure to snuggly hold rifles in place. This conveniently allows for different rifle storage and transport options. Fitted Nickel- plated exterior hardware latches. Made in the USA. All contents of this site are copyright © 2019 by The October Company, Inc. and its subsidiary Pocumtuck.